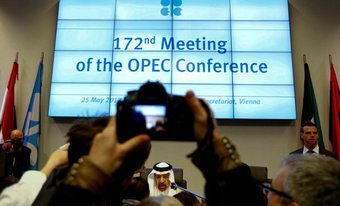 The world will still have a surplus of oil by end-March next year, Saudi Arabia’s energy minister said on Thursday, signaling a willingness to extend output cuts when OPEC meets at the end of November on whether to extend caps well into 2018. Khalid Al-Falih also said he did not want oil prices to rise too fast and too soon to shock consumers, adding that the exit from production cuts would be gradual to make sure market reaction is smooth. “We need to recognize that by the end of March we’re not going to be at the level we want to be which is the five-year average, that means an extension of some sort,” he said, referring to inventory levels in the developed world. “We have gone over 50 percent in reducing excess inventories but that means we still have some excessive inventories that we need to drain,” he told journalists on the sidelines of the UN climate conference in Bonn, Germany. Falih said it was too early to make an assessment on a possible extension to OPEC’s global oil output cuts now, but said Saudi Arabia favors making an extension decision at the next OPEC meeting at the end of the month. He said Riyadh was in extensive consultations with all colleagues around the world within and outside OPEC. He said OPEC will have a better picture closer to the meeting on market fundamentals that will help in making the decision. “We are waiting for October data to be fully developed and shared with the technical team,” Falih said. Asked how OPEC would deal with potential supply shocks to the market including from OPEC member Venezuela where oil production hit a 28-year low recently, he said OPEC’s reaction would depend on the length of the disruption. “I assure you that nobody will be short of oil but at the same time we will not stop our current action until global inventories are rebalanced,” he said.